ConvaTec Aloe Vesta Protective Ointment from HealthyKin.com is an excellent barrier/ointment for routine use in incontinence care. The petrolatum-based ointment is easy to apply. It provides an effective barrier that seals out moisture, contains emollients to moisturize and is non-sensitizing and fragrance free. Excellent product. Creates a barrier to keep germs from getting in and causing infections. And, is so comforting to your skin. I love it! Excellent moisture barrier! Excellent for sores or chafed, tender areas under skin folds. 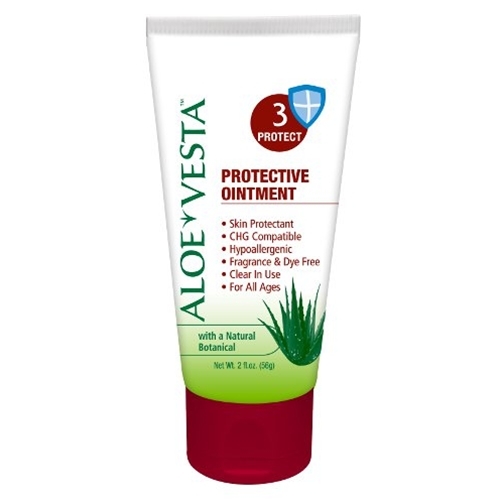 As a very large person with lots of deep skin folds, "nooks and crannies", I wouldn't be without Aloe Vesta Protective Ointment. I have tubes in my make up bag, my travel kit, my hand bag and at my bed side. If an irritation appears, I immediately apply a small amount of ointment and within a matter of hours, it's gone. An outstanding product! This product really works for skinfold issues. It is a shame it is no longer available in the stores such as Wal-Mart, Walgreen's, Rite Aid, etc. This product is the best . My wife has been bed bound for 15 years , NO BED SORES . Fast and quick shipment . This is used on my husband who is in a health center and I take it for him so the technicians and nurses use this on any skin breaks and does very good.